Bottle Counter and Rate Meter Module (Standard). Conveyor Speed Monitor with encoder and alarm Module (Standard). Missing Cap Detector Module (Standard). Exclusive user friendly Allen Bradley color touch screen controls for ease of set up/operation. Solid one piece heavy duty welded frame on swivel castors with S.S. leveling screws. Fits over existing conveyor complete with effortless linear height adjustment. Exclusive customized sensor modules complete with fully adjusting stainless steel patented clamps to adjust from one container size and cap size to another with calibrated controls, dials and scales for ease of set-up. 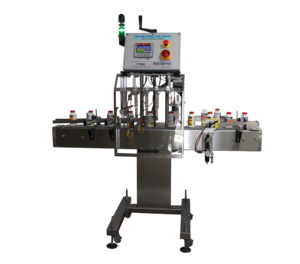 Outputs and controls for optional reject bottle system. Capable of holding 50 recipes. S.S. guarding/Lexan door with interlocking safety switches. On screen event data and fault counters. Numerous inspection modules available to complete the detection/inspection and rejection of defects for your exact needs. Custom inspection modules available as needed. Consecutive fault indicator with alarm. Reject System to push bottles off conveyor if they register as a fault.